AMATUS (AMÉ), a member of the Grenoblois nobility, St. Amatus was, as a child, placed in the Abbey of St. Maurice, Agaunum, present-day Saint-Maurice-en-Valais Switzerland. After completing his education received monastic tonsure at the Abbey, and later lived as a hermit for over thirty years. In 614 his spiritual father, St. Eustace (29th March), encouraged him to move to Luxeuil Abbey in Burgundy. While at Luxeuil, St. Amatus converted St. Romaricus (8th December), and the two of them went on to found the double-monastery of Remiremont in 620 with St. Amatus serving as first Abbot. St. Amatus reposed 630. AMATUS, the particulars concerning this saint have become rather muddled over the ages, hence there is some confusion about his life. The majority opinion seems to be that St. Amatus served as an Abbot of Agaunum, and later as the tenth Bishop of Sion in Valais (Switzerland). St. Amatus reposed in 690. BARSENORIUS, (Seventh Century), a spiritual child of St. Leutfridus of La-Croix (21st June), and an Abbot of La-Croix-Saint-Leuffroi in present-day northern France. The relics of St. Barsenorius are enshrined at Fécamp Abbey in Normandy. COLUMBINUS, the successor of St. Deicola (18th January) as Abbot of Lure, about 100 km (60 miles) east of Dijon, in the Vosges. St. Columbinus reposed circa 680. HADUWY (HEDWIG), a noblewoman, and granddaughter of St. Ida of Herzfeld (4th September). Following the death of her husband in 849, St. Haduwy received monastic tonsure, and from 858 until her repose in 887, served as third Abbess of the Imperial Abbey of Herford (Reichsfrauenstift Herford) in the Duchy of Saxony. MAURILIUS, a native of Milan who studied under SS. Ambrose (7th December) and Martin of Tours (11th November). St. Maurilius accompanied St. Martin when he went to Gaul, and in time was consecrated second Bishop of Angers (circa 423), reposing circa 453. NECTARIUS, the seventeenth Bishop of Autun from 540 until his repose in 549 or 550. He was a friend of St. Germanus of Paris (28th May), whom St. Nectarius appointed to serve as Abbot of the Abbey of St. Symphorian, Autun (Abbaye Saint-Symphorien d'Autun). PHILIP, Prefect of Egypt under Commodus (180 - 192), he was dismissed from this post when it was learnt he had been baptised. He was then chosen to be Bishop of Alexandria, but the new Prefect sent assassins who mortally wounded St. Philip while he was praying, and he reposed three days later. 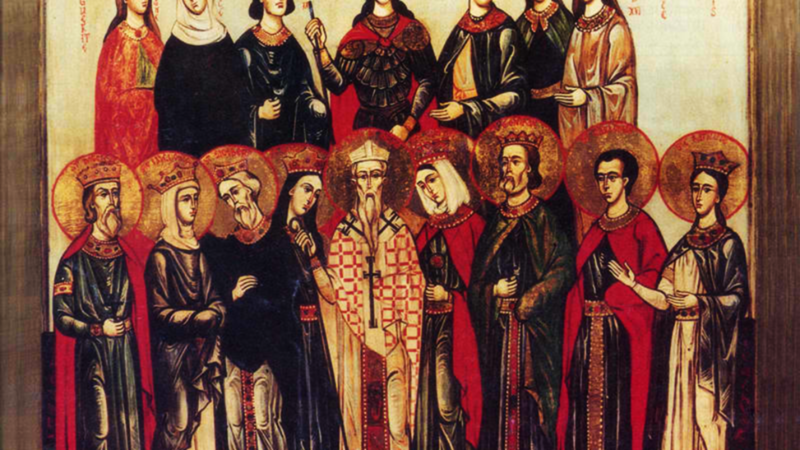 St. Philip was also the father of St. Eugenia of Rome (24th December), in whose home SS. Protus and Hyacinth (11th September) were employed. WILFRIDA, St. Wilfrida was the mother of St. Edith of Wilton (16th September), who, after the birth of her daughter, received monastic tonsure from St. Ethelwold of Winchester (1st August) at Wilton Abbey, eventually serving as its Abbess. In time, her daughter joined her at Wilton as a monastic. St. Wilfrida reposed circa 988.